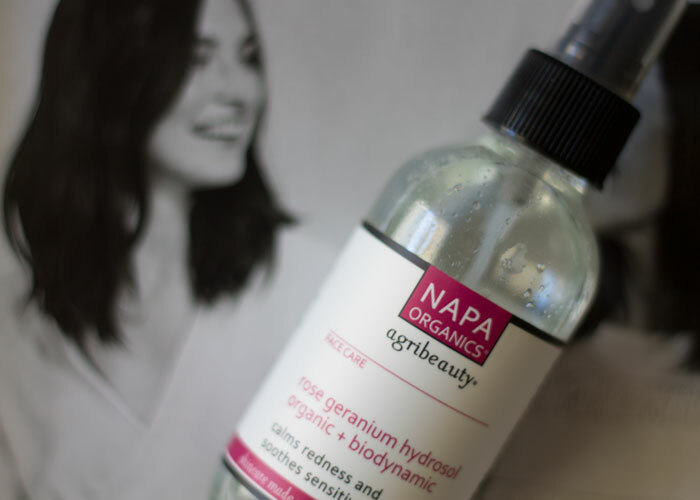 Simple and beautiful, Napa Organics’ Rose Geranium & Lavender Face Mist features hydrating hydrosols that calm the skin with every even-mist spray. With just two certified organic and Biodynamic ingredients, this face mist boasts a floral yet earthy aroma and balances the skin after cleansing and throughout the day. This short, sweet ingredients list is comprised of hydrosols, or floral waters, which are created during the plant steam-distillation process. A hydrosol is very similar to an essential oil but is not as concentrated — making it very beneficial for everyday use on the skin. Think about how much you love lavender or rose geranium essential oils — now think about using the fragrant water that was steamed with the original plant. That’s exactly what you get in a hydrosol! While some may be turned off by the lack of a fancy, long ingredients list, those who have extremely sensitive skin or a preference for the simple yet elegant will love Napa Organics’ Rose Geranium & Lavender Face Mist. It’s one you won’t feel guilty about indulging in every hour of the day — and that’s good, because the misting bottle is so perfect that you’ll find yourself spritzing often. I’m excited to see more from Napa Organics in the future. What other beautiful hydrosols are waiting to be bottled up on your California winery? What do you think about simple ingredient beauty products? How do you choose a facial mist? Ever tried a hydrosol? Tell me your thoughts in the comments section!